COMMENT: The Grenfell Tower fire will undoubtedly have far reaching consequences for the way we live, the way we construct and renovate our buildings and the way we deal with fires in high rise buildings. It should also have consequences for the way we manufacture domestic refrigerators, but we wonder whether it will. The Cooling Post has resisted commenting on the possibility that a domestic fridge was the source of this tragic fire until it was officially confirmed. This was despite many calls and comments from within the refrigeration industry blaming hydrocarbon refrigerants and questioning whether we should be using flammable refrigerants at all. Now we know that a Hotpoint fridge freezer was the original source of the fire. There were fears that the very distinct cladding issue and the propagation of the fire would overshadow concerns as to the safety of our domestic fridges, but the government has now ordered a full investigation. 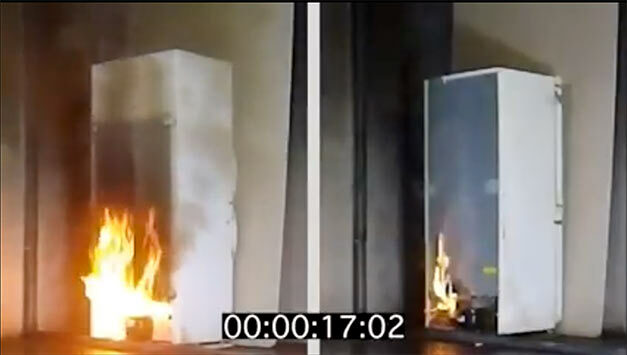 We are no apologists for flammable refrigerants, but we do not believe that the now standard use of flammable isobutane in domestic fridges in the UK and Europe had any direct effect here. While we do recognise that any hydrocarbon refrigerant contained in the fridge freezer is hardly likely to have acted as a fire suppressant, it seems unlikely to have been the cause of the initial conflagration. In fact, we do not know yet whether the fridge freezer in question actually contained isobutane, but its year of manufacture (2006-2009) suggests it probably did – particularly as isobutane was already being used in earlier Hotpoint models at least as far back as 2002. Earlier accounts of the fridge “exploding” have added to the confusion. Like Chinese whispers, someone’s report of a kitchen appliance smoking and bursting into flames becomes exaggerated as an “explosion”. Not that domestic fridges don’t explode. They have done and continue to do so. We have investigated a number of occurrences of exploding fridges. Although rare, these occur when the isobutane refrigerant leaks into the fridge and is sparked by an electrical component. The resulting explosion can cause considerable damage to the room in which the fridge is located, but, in our experience, has never been associated with or resulted in a fire. 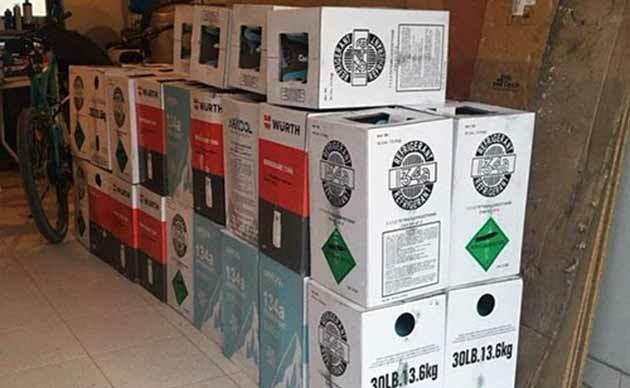 Flammable refrigerants will be a key element in meeting European HFC phase down laws. 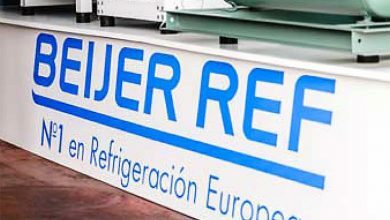 In many cases they are also more efficient than current refrigerants but they require careful, considered handling by properly trained individuals. Equally important, equipment manufacturers must be made to ensure that they are not being used in potential “firebombs”. It is tragically ironic that the London Fire Brigade, the busiest brigade in the UK, and one of the largest firefighting and rescue organisations in the world, was at the forefront of efforts to contain the fire and rescue the inhabitants at Grenfell Tower. The LFB has long-campaigned for changes to the manufacturing standards of domestic fridges, describing them as “potentially the most dangerous appliance in the home”. There are around 300 house fires in the UK each year involving a fridge or freezer and these have been found to exhibit a higher degree of fire spread than other types of appliances like washing machines, dishwashers or tumble dryers. Fridge freezers are one of the few appliances which run continuously, making it vitally important that they should be designed and manufactured to ensure the chance of fire is very low, and that if a fire occurs it is contained within the appliance and not be able to spread. Failures of starter relays, PTC switches, mechanical defrost switches and capacitors have all been identified as ignition sources, while plastic drip trays, twin-wall backing materials and polyurethane foam insulation panels foamed with flammable hydrocarbons have been identified as causes for the escalation and spread of the fire. Significantly, the LFB has never highlighted the use hydrocarbon refrigerants as being a contributory factor. 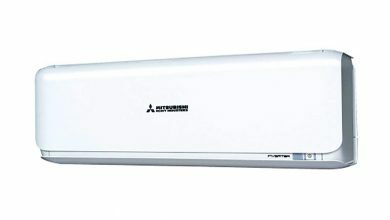 The steel metal backs previously used in fridge/freezers have been replaced by materials which can be easily ignited. These include a silvered cardboard or foil barrier covered by polyurethane or, more recently, twin-wall polyethylene/polypropylene panels. Fire tests have revealed that twin-wall backing materials are very easily ignited and can promote extremely rapid flame spread to involve insulation panels, whilst producing intense heat and large volumes of toxic smoke. It should be made clear that, as yet, we don’t know how the Hotpoint fridge freezer in question was constructed or the design, construction and componentry used. Incredibly, while appliances that the LFB consider to be “potentially dangerous” are freely allowed to be sold to the general public, strict safety procedures are applied to their disposal. Tests carried out by the UK Environment Agency in 2012 found that all tested fridge foam samples were “highly flammable” and advised that all fridge insulation foam produced using a hydrocarbon blowing agent should be classified as hazardous waste. The study identified options for preventing accidents and incidents and ensuring that all fridges containing hydrocarbon blown foams were sent to appropriate permitted treatment facilities for storage and further treatment. In Europe the only real driver for improving the fire safety design of appliances is to legislate through changes to standards, but any amendments to standards are incredibly protracted, even if all parties agree. And, sadly, the Cooling Post believes that while the UK backs changes to the safety standards, these are not supported by other EU member states. Also, European standards are largely controlled and set by manufacturers, a situation which the LFB believes creates a potential impediment to change. In contrast, in the USA design and regulation of refrigerators is driven by the insurance industry and the threat of litigation. The government has ordered a full investigation by “technical experts”. There are many hugely knowledgeable people within the refrigeration industry, we only hope the government department responsible chooses the right ones – and surely this should include at least one representative from the London Fire Brigade. Irrespective of any findings that come out of the Hotpoint fridge investigation, domestic refrigerator standards must be improved.